Our long record of consistent year-on-year performance improvements demonstrates impeccable skills in financial management. As the majority of our financial assets are loans and advances that are held on an mortised cost basis, the risk of short-term distress shocks is reduced, and thus a healthy overall financial position is upheld. The key financial indicators of the Bank remain healthy with a return on average assets of 1.8 percent and a return on average equity of 13.7 percent. Despite the challenges faced by Bahrain and the regional banking sector, the Bank managed to maintain its high performance in 2018, achieving record profitability of BD 67.1 million attributable to shareholders for the year ended 31 December 2018, representing an increase of BD 8.4 million or 14.4 percent growth over 2017 results. The key financial indicators of the Bank remain healthy with a return on average assets of 1.8 percent and a return on average equity of 13.7 percent. The basic earnings per share increased from 48 fils to 56 fils. The Bank’s liquidity position remains comfortable with liquid assets to total assets at 27.6 percent (2017: 34.7 percent). This section provides a review of our Group’s financial performance, focusing on the consolidated operating results and BBK’s consolidated statement of financial position, including its overseas branches, subsidiaries, joint ventures, associated companies, and indirect investment in associates through subsidiaries. The consolidated financial statements have been prepared and are presented in accordance with the International Financial Reporting Standards, Bahrain Commercial Companies Law, Central Bank of Bahrain (CBB) and Financial Institutions law and CBB rulebook requirements. The year 2018 was the last year of BBK’s three-year strategic plan in which the Bank continued its steady and consistent performance, maintaining proactive management of risks and costs while focusing on developing domestic and cross-border business opportunities. Despite the general weakness in economic trends regionally and globally, the Net Profit for 2018 (attributable to the owners of the Bank) increased by 14.4 percent from last year, amounting to BD 67.1 million. The total operating income for the year increased by BD 18.1 million or 12.6 percent and stood at BD 161.2 million, reflecting the success in diversifying sources of income. Continuing BBK’s prudent approach to risk management and provisioning, the Bank conservatively provided for adequate provisioning levels in 2018, applying the IFRS 9 accounting standard. This standard considers expected credit losses instead of the incurred losses mandated by the previous IAS 39 to measure impaired exposures caused by market turbulences. Net interest income increased by 20.9 percent to BD 110.0 million (2017: BD 90.9 million). This was achieved through deploying more funds in higher yielding and liquid investments and treasury bills, respectively reporting increases of 32.0 percent and 46.5 percent. As a result of the strong growth in total earning assets, active management of balance sheet and increase in market interest rates, the net interest yield ratio increased from 2.7 to 3.1 percent. Other operating income consists of non-interest income, derived from business activities such as dealing in foreign currencies, investing in funds other than fixed-income funds, the sale of corporate banking and retail banking services, investment trading, and income from associated companies and joint ventures. Total other income reported for year 2018 stood at BD 51.2 million compared to BD 52.2 million reported for 2017. The net fees and commissions, being the main component of total other income; stood at BD 28.2 million, compared to BD 31.1 million reported last year, while income from associated companies stood at BD 4.1 million (2017: BD 5.5 million) due to impact of implementation of IFRS 9 by the associated companies. Other income relating to foreign exchange, and investment income increased by 6.5 percent to BD 15.3 million, (2017: BD 14.3 million). Due to the continuous investment in human capital resources and technologies, the Bank’s operating expenses increased by 6.9 percent, from BD 54.0 million to BD 57.7 million. Staff costs increased by 5.0 percent, while non-staff related costs increased by 10.2 percent to reach BD 21.3 million (2017: BD 19.3 million). Nevertheless, the Bank’s prudent cost control policy and strong revenue-generating capability enabled improvement in its cost to income ratio to 35.8 percent (2017: 37.8 percent). The Bank follows the International Financial Reporting Standard 9 (IFRS 9) with regards to accounting for the impairment of financial assets. IFRS 9 replaces the incurred loss model in IAS 39 with an expected credit loss model. The new impairment model also applies to certain loan commitments and financial guarantee contracts. Under IFRS 9, credit losses are recognised earlier than under IAS 39. The Group applies a three-stage approach to measuring expected credit losses on financial assets carried at amortised cost and debt instruments classified as FVOCI (fair value through other comprehensive income). Assets migrate through three stages based on the change in credit quality since initial recognition. This approach of provisioning for impairment of the Bank’s financial assets is aimed at providing more realistic estimates of the impairment in the value of assets. The net provision charges during 2018 amounted to BD 35.4 million, compared to BD 29.0 million in 2017. The increase came mainly due to overall market sentiments and the bank’s conservative approach in ensuring a high degree of coverage for its Non Performing Loans (NPLs). The Bank’s total comprehensive income attributed to the owners stood at BD 47.4 million for the year ended 31 December 2018, compared to BD 65.0 million at the end of 2017. While the core operating activities of the bank remained robust and resulted in higher net profit, the bank’s other comprehensive income has been impacted negatively by the instability and volatility in financial markets which led to unrealized negative valuations on investment securities and foreign currency translation adjustments. The Group maintained its strong financial position and comfortable liquidity. As at 2018 year-end, the total footing of the group stood at BD 3,581.7 million (2017: BD 3,763.1 million). The Bank has been consistent in achieving a good balance between deposits and loans and advances with a comfortable ratio of net loans and advances to customer deposits of 74.6 percent as of end of 2018 (2017: 66.3 percent). While the core lending and investing activities remained robust and continued to grow, the decrease in total assets was attributed to the decrease in cash and balances with central banks. Loans and advances increased by 1.8 percent, mainly due to growth in the retail loans portfolio. Non-trading investment securities increased by 6.8 percent reaching BD 800.3 million at the end of 2018 (2017: BD 749.0 million). This was mainly due to the increase in investment activities in selective domestic and international markets. The investments portfolio is dominated by regional governments’ bonds and sukuk and is substantially hedged against exposure to interest rate risk. The loans and advances and investment securities are well diversified across various economic sectors and counterparties. The funding structure of the bank continued to be very robust with low reliance on the interbank market. Customer deposits remained the dominant source of funding, representing 77.1% of total liabilities. While the bank continued to grow its retail customer base, increasing its retail liabilities to BD 823.8 million (2017: BD 791.5 million), the total customer deposits decreased to BD 2,374.5 million as of end of December 2018 (2017: BD 2,623.6 million) due to overall reduction of liquidity from the GCC markets. Borrowing under repurchase agreements and Term borrowing are integral parts of the bank’s medium and stable funding sources. As of end of December 2018, Borrowing under repurchase agreements stood at BD 199.0 million (2017: BD 161.3 million) and the Term borrowing stood at BD 144.5 million (2017: BD 199.0 million). The Bank has implemented the Basel III framework for the calculation of capital adequacy since January 2015, in accordance with Central Bank of Bahrain guidelines. Total equity attributable to the owners of the Bank stood at BD 497.7 million at the end of 2018 (2017: BD 498.6 million). 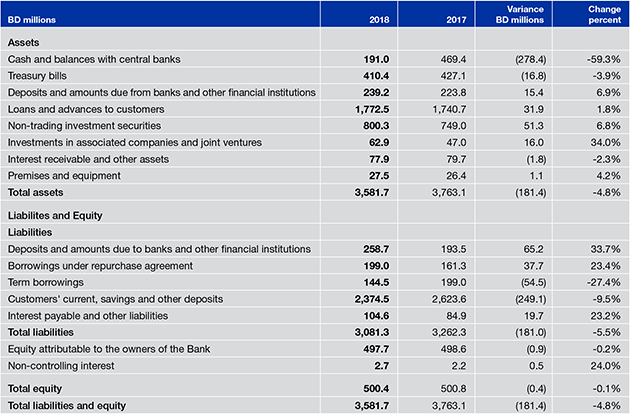 The Bank continued to maintain a comfortable capital adequacy ratio of 19.6 percent (2017: 20.0 percent), well above CBB’s minimum regulatory requirement of 14.0 percent for Domestic Systemically Important Banks (D-SIBs). The Group is keen to maintain strong capitalisation to support future strategic plans, through adoption of dynamic profit retention policy. Our noticeable growth over the years is a result of our sustained culture of superior performance, our widespread participation in both local and international markets, and excellent customer service, which enables us to sustain the momentum we have built over the years and to enhance value for shareholders.